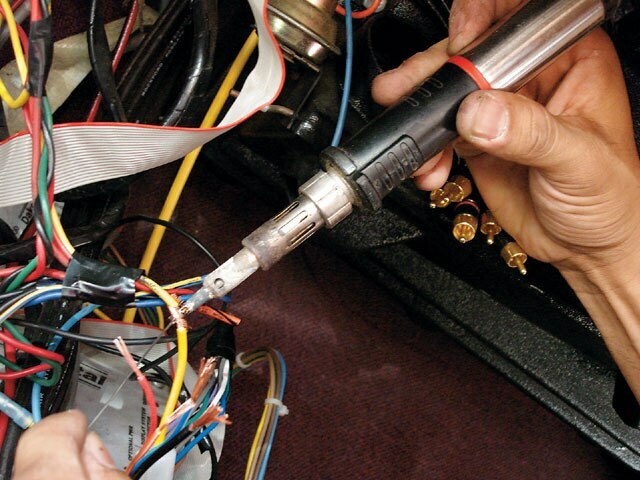 Upgrading Your Radio Is Not As Simple As You Might Think. 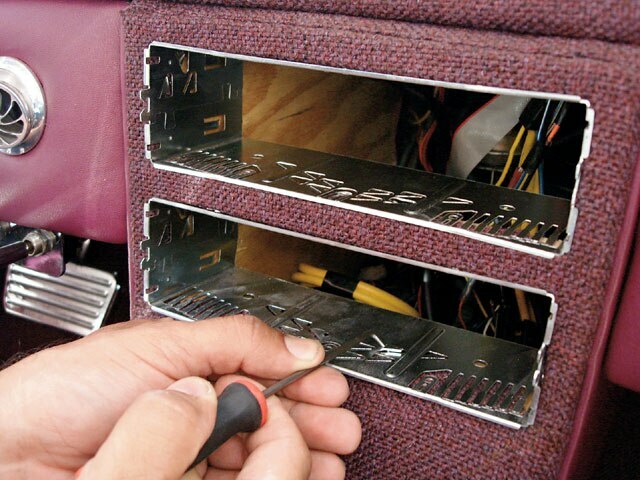 So you have a custom car with an outdated system and want to upgrade the radio; easy, right? It’s just the radio. Let’s look at this from an installer’s perspective for a minute. When you have a source unit with multiple audio and video inputs and outputs, the change is not as simple as you might think. There are a lot of wires transferring the audio and video signals to their respective processors, and nine times out of 10 these cables were routed to the processor’s brain in such a way that rerouting is more difficult than running new cables. A clean installation involves clean tight wire runs so these cables are not orientated in a way that makes them easy to move. So one major challenge is finding out exactly where the wires were ran and if they can be moved. If not, then be prepared to buy new ones and have your entire car ripped apart for the re-installation of the new wires. So when you think of your radio retrofit how much time did you allow for reconnaissance? No, this not a covert military operation, but even the installer who put the stuff in may not always remember exactly where he put the modules. 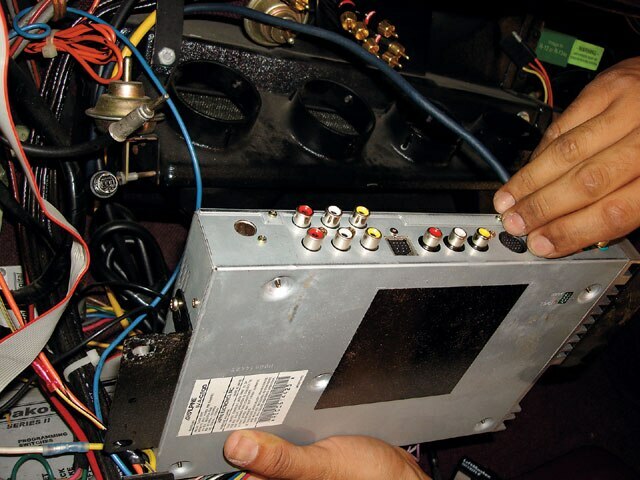 So even though you might think that ripping out the old radio and putting in the new one should only take a hour, don’t forget the time of taking apart major panels of your interior, and looking for the important components that have to be removed or reconfigured. Things like EQs, triggering devices and even video monitor source units may need to be accessed and modified when adding a new radio. The moral of this story is don’t underestimate the complication of an electrical component retrofit. Yes, you have a radio in there now; yes, you have wires in there now, but it doesn’t mean that will work with the new unit or configuration that your new unit brings. Just follow along and we’ll show you. 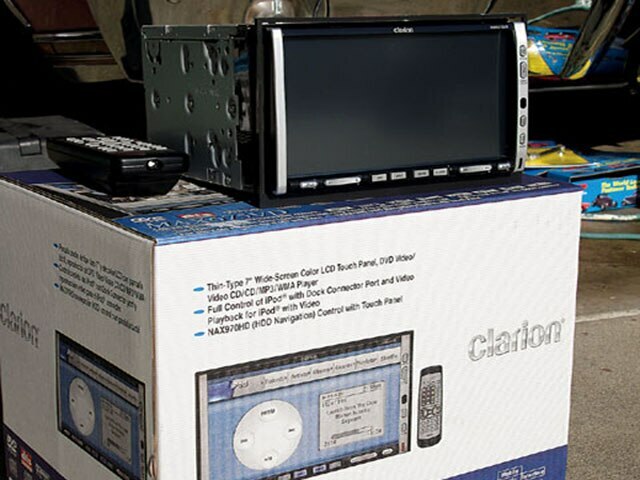 Clarion’s MAX675VD will replace the out-of-date separate monitor and DVD player. 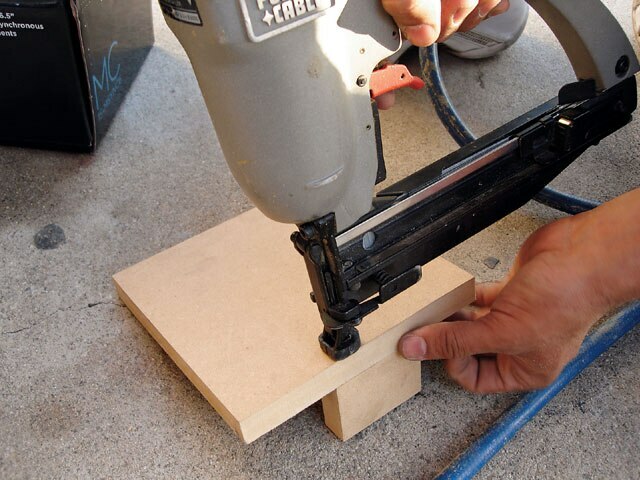 The MAX has everything incorporated so the installation will be that much easier. The original installation left a healthy gap between the two units that will have to be compensated for later. This upgrade will clean up the appearance and safety of the dash area as well. 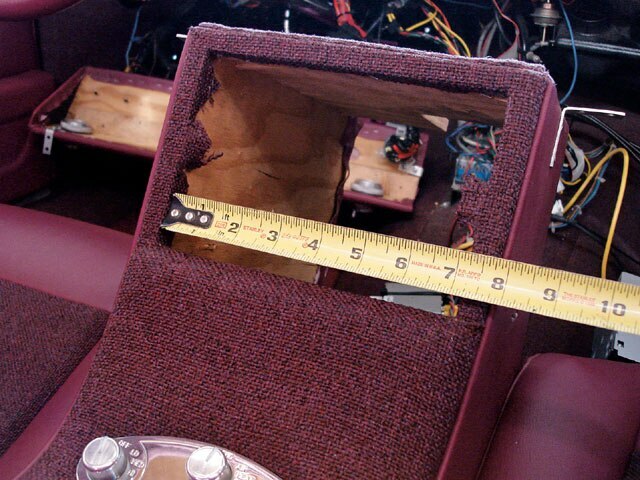 Notice how the current installation blocks the driver’s view of the custom instrument panel. With the units clear and out of the way, we can remove the radio installation cages. The wiring can commence after the old unit was removed. First on the agenda was testing and connecting to the power wires. From here, we had to re-route the audio/video cables and were lucky enough to have enough slack for the re-route. Hey, where’s the main control unit for the radio? You guessed it, tucked way up under the dash. 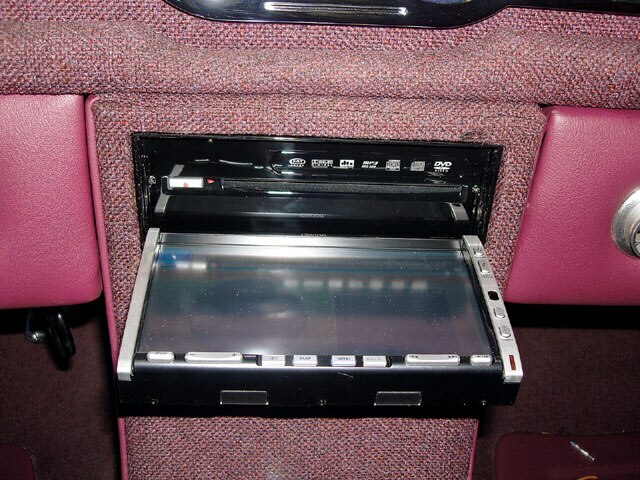 The entire lower dash and center console had to be removed in order to access it. Now that we’ve accessed the unit, we have to unplug all of the cables. Now that we’ve tested and confirmed that the unit operates properly, we can move onto the mounting of the unit. The challenge here is that the double units are actually intended for import vehicles with the special double DIN opening. We’ll have to make a special mount for the radio. Notice the center was already trimmed out. With the unit unscrewed, we can finish removing the cables so the re-installation can begin. 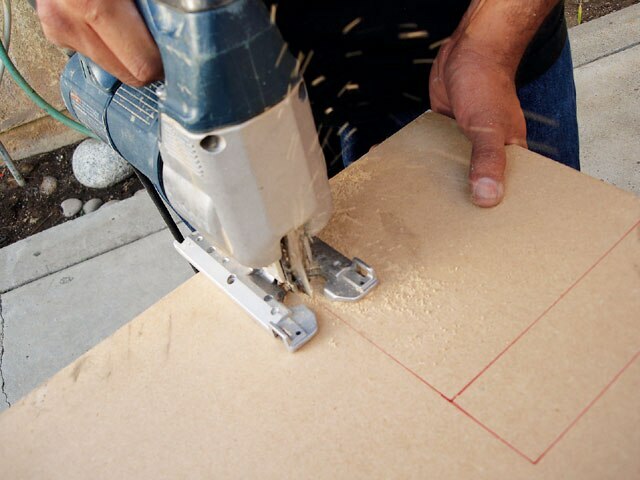 Our measurements are then transferred to a sheet of 31/44-inch MDF. We will have enough room for a piece this thick as we need to compensate for the removed center piece. 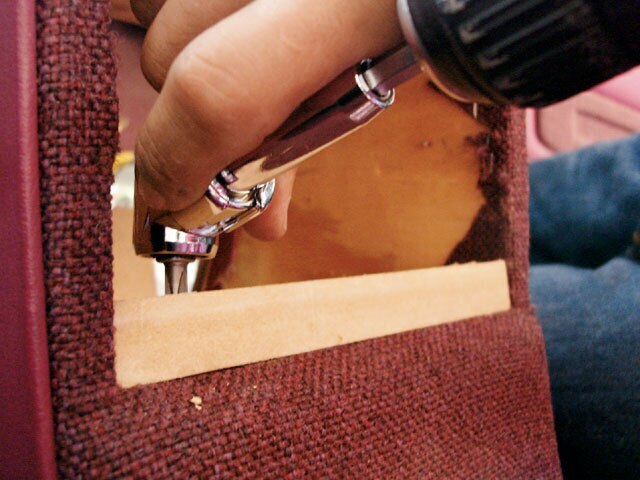 The bracket is then predrilled and preliminarily screwed in place. 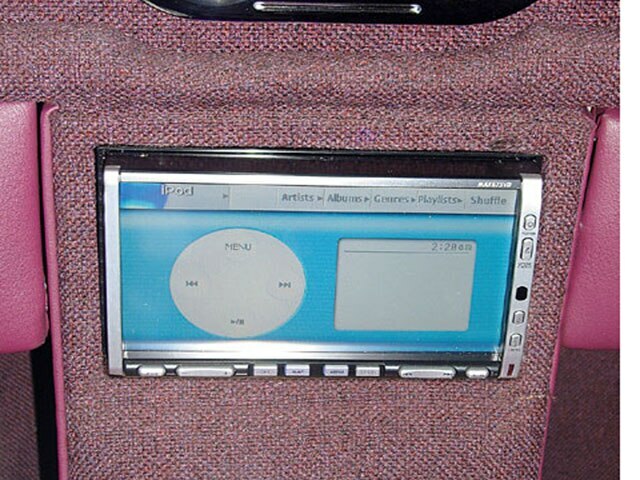 Using the iPod interface for the MAX unit, we can hide the iPod and still have a virtually limitless supply of music that can be accessed through the screen of our source unit. All assembled and ready to show. Not only does the unit look great, but we now have no obstructions to our instrument cluster. Not quick and easy, but a job well done none the less.